Directions: Mix 1 teasoon sugar into 1/2 cup of warm water (110° to 115° F), then mix in 2-1/4 teaspoons yeast. If mixture has risen to the top of the cup by the end of ten minutes, yeast is very active. If not, it needs to be replaced. 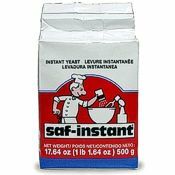 Click to see our SAF Red Label Yeast.